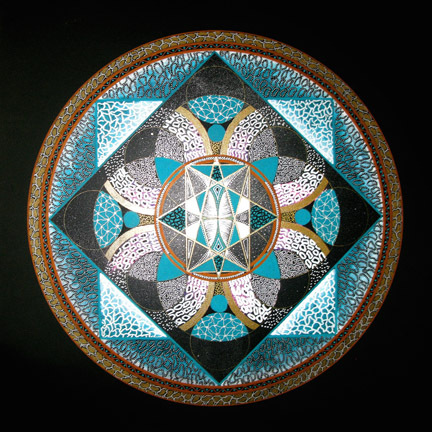 Mantra of the Mandala for August by Patricia Fitzgerald, Irish Mandala Artist, Healing Creations. This mandala was commissioned by the siblings of a wonderful friend of mine as a birthday gift. It was a joy to create and made me ponder friendship deeply. The Japanese have a word, kenzoku, which translated literally means “family.” This suggests an affiliation between people who have made a kindred commitment and who therefore may share a similar destiny. Kenzoku suggests the presence of the deepest connection of friendship, of lives lived as companions from the distant past. Many of us have people in our lives with whom we feel the bond described by the word kenzoku. They may be a mother, a brother, a daughter, a cousin. Or a friend from school with whom we haven’t talked in decades. Time and space do nothing to dwindle the bond we have with these sorts of friends. So how do we make such friends? Become a true friend yourself. As Gandhi put it: “Be the change you wish to see in the world.” Be the friend to yourself that you want to have manifest in your life. We all attract people into our world whose character is a reflection of our own. You don’t have to change yourself into what you think others might find attractive. No matter what your interests are, others share them someplace. Be true to yourself. Embrace what truly interests you. You will find these connections will be drawn towards you like a magnet.